Pest Control Services Houston | Stuarts Pest Control Inc. Whether you’re a homeowner or commercial client, Stuart’s offers the pest control services you’ll need in the Houston Area for both interior and exterior. We have the experience and effective procedures necessary to handle roaches, ants, silverfish, spiders, termites, rodents, fleas, mosquitoes and many other pests. Stuart’s Pest Control is fully insured to meet any commercial liability needs required of pest control services in Houston. All of our service employees are licensed T-D-A Pest Control Services “Certified Applicators” and highly trained and experienced to handle applications in multiple categories. We have a solid reputation for integrity at Stuart’s Pest Control. We use only top grade products and chemicals from leading manufacturers. We can usually give you accurate price estimates on the phone. We are specialists in providing pest eradication solutions, and the finest pest control services Houston requires as a Gulf Coast city. General quarterly pest control service in Houston prevents a lot more pest problems than are specified in the guarantee. 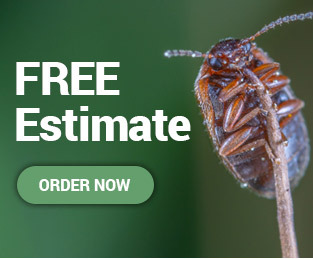 The service is guaranteed to prevent all types of roaches, all ants and silverfish for 90 days. Since multiple interior ants are difficult to prevent, we use a combination of non-repellent pesticides and baits to eliminate the colony wherever it is..
Each service includes a thorough interior and exterior pesticide application, bait and trap placement as needed, and a visual inspection of accessible areas for termites. A wood-destroying insect report is not included, but the included inspection is the same. While the pest control service technician is at your home in Houston he can spray the lawn for a discounted price if there is a problem with mosquitoes, chinch bugs, fire ants or any other pests. A light lawn and shrub spray monthly or quarterly is usually adequate to keep mosquitoes away. It works well one or two days prior to outdoor events. For small lawns a light spray works well. For pest control services in large areas and for long term control we use topchoiceT granules which is guaranteed for one year. They are usually a symptom of a moisture problem. The repair of the moisture problem will get rid of the ants. Carpenter ants are included in our quarterly service warranty and are easily treated with baits, sprays, or foam. We spot treat with Fuse or Premise foam, or Termidor for pest control services in Houston. We do not recommend fumigation. We can pinpoint the exact location of the termites and perform an accurate and effective, minimally invasive treatment. Termites are usually symptomatic of a moisture or a maintenance problem. Our pest control services techs will show you how to check your home for termites and how to solve (or prevent) a termite problem. We use Termidor™ to prevent or eliminate subterranean termites and guaranty all treatments for five years. When more than a standard inspection is required we use “TERMATRAC”, a termite location device, to establish termite presence or absence. Stuart’s does not offer any warranty against clothing moths. Any damages caused by moths or any other insects are the responsibility of the homeowner. We can help solve clothing moth problems using pheromone baited traps that will capture the male moths. The traps can be placed to pin point the source of the primary population and eliminate the invasive species. Dry cleaning of clothes and vacuuming of rugs (especially under furniture) is key to damage prevention. After food, shelter, and access have been denied, we place bait stations on the property perimeter and trap stations as needed on the interior. Traps and bait are placed as needed.